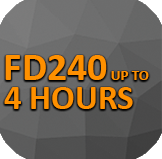 Samson's FireGuard range consists of three doors that each offer a certain number of minutes that it can prevent the spread of fire - the FD240 offering up to 4 hours of fire protection! The Samson FireGuard offers fantastic levels of durability, with a 10 year anti-corrosion guarantee (subject to location), in addition to the above fire protecting properties. The doors consist of 1.5mm frames and 1.2mm corrosion resistant steel sheets that are lockformed together by 1mm bonding skins. Appropriate for various internal applications such as in schools and workplaces, these doorsets can be installed quickly and easily as they are supplied pre-assembled with features and hardware already fitted. All doors in the range are made to measure, and therefore manufactured for a perfect fit during the installation process. These fire doors not only offer fire protection for internal applications, but also a sleek, fresh appearance for various styles of interior. 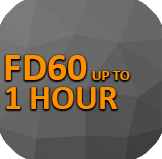 The FireGuard is finished in a polyester powder coat as standard in your choice of one of 75 shades, however there is also the option of RAL and BS coatings, as well as stainless steel with brushed, polished and patterned finishes also available. For applications requiring more trend and character, we also have a selection of beautiful woodgrain laminate finishes available for our range of FireGuard doors. There are various designs of vision panels available to be fitted, with different bespoke sizes and types of glass to suit your own specifications. Louvre panels with 50% air flow and side & over panels are also available with options dependant on individual requirements. We also have a large variety of mortice locks and latches for you to choose from, as well as a number of optional features that can be equipped such as 3-point sashlocks and mechanical keypads. The Samson VisionGuard is an excellent choice of door for any commercial environment, not only due to its sleek aesthetic of glass steel profiles, but its security and of course, fire ratings. 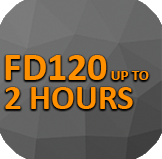 The VisionGuard can offer up to two hours of fire resistance with BS EN 1634-1 compliance. As the core of the steel profiles offer insulating properties, the door panel is able to significantly reduce the amount of heat that is transferred from one side of the door to the other in the circumstance of an emergnecy. 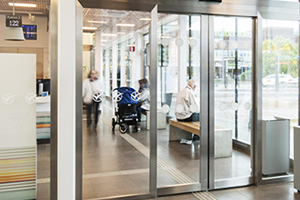 With other features available such as a sliding door with a fire resistance of up to 30 minutes, the VisionGuard steel doorset can be manufactured to your specific requirements, perfect for premises such as shops, offices and showrooms. 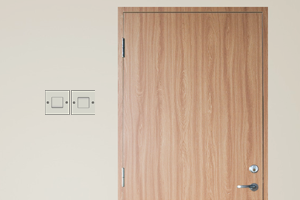 Hormann offer the T30, T60 and T90 sliding fire doors, and can resist high temperatures caused by a fire for up to 30, 60 and 90 minutes respectively. With additional qualities including smoke-tight properties, acoustic ratings, optional glazing designs and available in various RAL colours, these doors are suitable for various types of applications where fire precautions need to be taken.